Visit Texas eBird to find out what's being reported. Boy Scout Woods is an eBird hotspot. A combination of hackberry/oak motte, coastal prairie and wetlands one mile from the Gulf of Mexico on High Island. Open to the public year round, Boy Scout Woods has extensive boardwalks that make birding possible for wheelchair-bound birders. Volunteers host the Boy Scout Woods Sanctuary daily from mid-March to early May each spring. The High Island sanctuaries are fee sites. The fee helps defray the costs of maintenance, utilities and improvements for the entire Houston Audubon sanctuary system. A day pass costs $8, or for $30 a patch may be purchased which gives you an unlimited number of admissions to all High Island sanctuaries for one year. Each spring thousands of birdwatchers from all over the world come to sit in the grandstands overlooking Purkey's Pond, eager to see the many species of migrating birds that come to drink and/or bathe. When Houston Audubon received donated land from Amoco Production Company in 1993, Prothonotary Pond's primary vegetation was Chinese Tallow trees, an invasive exotic that provides little useful food for wildlife. One of Houston Audubon's habitat improvement projects has been the conversion of Prothonotary Pond from a tallow pond to one surrounded by native Bald Cypress. The new covered picnic shelter at Boy Scout Woods was finished just in time for spring migration in 2007. This has already become a favorite spot to watch the bird activity around Bessie's Pond. Funds for the picnic shelter were donated by Larry Wright in memory of his wife Shirley, who enjoyed birding in Boy Scout Woods. Boy Scout Woods consists of 60 acres of woods, coastal prairie and wetlands. 15.7 acres were purchased by HAS with the help of members and friends, 44 acres were donated by Amoco Production Company, and 0.3 acres were donated by Ted Eubanks. In 1982 Houston Audubon purchased the first 4 acres of oak/hackberry woods from Louis B. Smith, who had purchased the woods from Amoco Production Company and had added many kinds of fruit and nut trees. 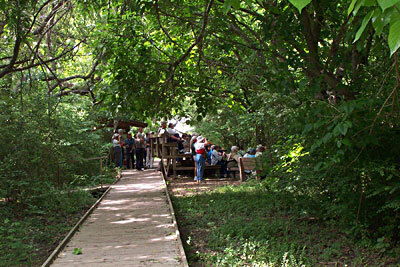 The sanctuary property was officially named the Louis B. Smith Bird Sanctuary in 1982. An additional 11 acres surrounding the 4-acre tract was donated to Houston Audubon by Amoco Production Company in 1994. Smaller tracts were acquired by purchase (Buceme Tract, 1.21 acres, 1993; Charpiot Tract, 0.46 acres, 1994) and donation (Eubanks Tract, 0.35 acres, 1993; Amoco Tract, 44.77 acres, 1994). The property was known as Boy Scout Woods before Houston Audubon purchased it because of the scout camp that existed on the property, and the sanctuary is still known by that name.